Discover behind-the-scenes stories from Te Papa’s experts, including curators, scientists, historians, collection managers, and educators. It’s a lovely spring Friday morning in Wellington. 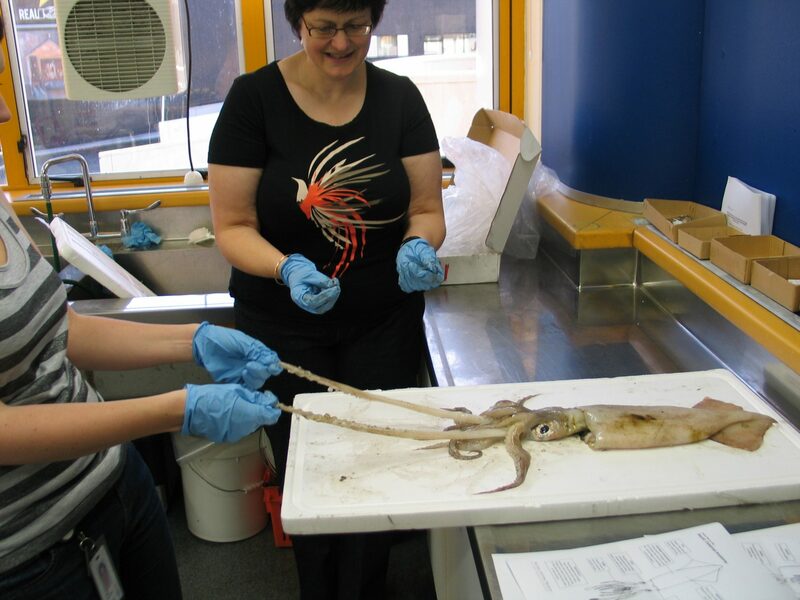 What else would we (Pamela, Chris and Judy – our brave and newest squid team member) be doing other than dissecting a couple of nice fresh squid from the local wholesale fish supplier? It’s all in the interest of bringing you a bigger and better exhibition on the colossal squid, as we come to grips with squid anatomy (literally). We quickly discovered that not all squid are the same on the inside (surprise) and that once inside them it can be a messy business. Note to self – try to avoid puncturing the ink sac until the end. We started with an arrowsquid. We checked the arms and the tentacles – all eight arms and two tentacles present and correct. The suckers on the arms had hard little circles, which pop out – who needs to pop bubble wrap? Cutting through the mantle was hard work – you need a sharp pair of scissors or a good scalpel. Pulling back the folds of the mantle reveals the inner organs. Working out what they all are is a challenge but we think we identified the gills, the stomach and caecum and what we thought was the hearts. Yep, that’s right, a squid has three hearts. 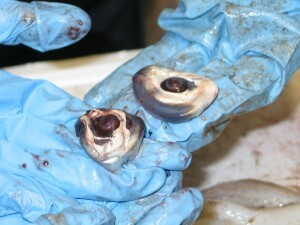 The eyes were exciting to dissect. It was a thrill to extract the lenses and find that they come in two parts – just like the colossal squids, and indeed all squid. The arrowsquid lens is a lot smaller – around 0.5cm across – compared with the huge orange-sized lens of the colossal. 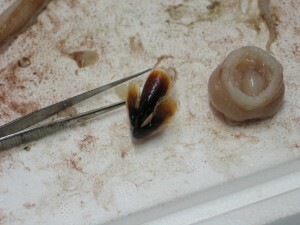 It was also really exciting to remove the beakfrom the really dense muscular tissue surrounding it. First we got the lower beak out, then the upper beak and we could see how they fit together. Then we came across the radula – it’s a bit like a tongue – with it’s amazing rows of sharp, raspy teeth. Stomach contents of our squid were examined. We could feel the crunchy bits inside, and these turned out to be fish vertebrae. Last but not least we cleaned away all the messy bits to expose the mantle – and extract the gladius, or pen. This incredible structure just glides out of the mantle and looks for all the world like it’s made of plastic. 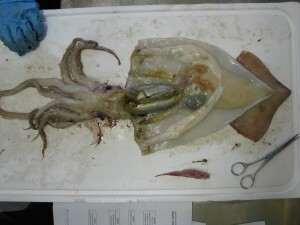 So I’m hooked on squid anatomy – there will more on the broad squid we examined next, shortly. Yes, these squid eyes were pretty amazing – especially dissected out like that. I’m not sure if we can help you with an image of a whale eye outside of a whale but I’m sure someone out there studies whale eyes and whale vision. Te Papa’s whale expert is away in the States at the moment so I can’t ask him. We are about to open our Whales Tohorä exhibition at the National Geographic Museum in Washington DC. Happy to ask him for you when he’s back in NZ. I guess all eyes are gross, if they’re just sitting out like that. I want to see a whale eye that’s sitting outside of the whale. Stay up to date on our latest blogs. Enter your email address and we'll let you know when we publish new posts.